Isn't it just common sense to practice sun safety for kids at all times? Because the reality is that any sunburn during childhood has the potential to radically increase the risk of cancer later in life. Without watching carefully, as children inherently love being actively engaged outdoors, a blistering sunburn, never mind an ordinary one, is all too possible. Don't all children love being at the seaside? There are many organizations that proclaim that during your childhood you will obtain at least 80% of your lifetime's exposure to the sun. Nevertheless, protecting children is a fundamental part of being a parent and these statistics may very easily apply to you and your children. Generally, the sun's UVB rays are strongest between 10 am and 3 pm and these are the rays that cause a sunburn. This varies depending on the time of year and your geographical location. However, UVA rays cause a deeper damage to the skin and can penetrate clouds and even glass. They are not the rays that cause a sunburn but are just as important, if not more so, than UVB rays to avoid. Other aspects to contend with are reflections off sand, water, snow or even some shady spots. So if your child is going to be outdoors, use a sunscreen if they are likely to be exposed for longer than 30 minutes. A little bit of sunshine without getting burnt is good for Vitamin D creation, but this only requires about 20 minutes depending on their skin type. Choose a non-toxic, non-chemical sunscreen and apply correctly. If you do choose to use a sunscreen, it is an absolute waste of time to buy one that is toxic and then slather it all over your young child! Their skin is delicate and not as equipped as our adult, weathered skin and so will absorb the toxins more rapidly and readily. So take time to choose a sunscreen that is non-toxic, without any harmful chemicals that will be absorbed into their skin. The physical or mineral sunscreens, like those using zinc oxide, will stay on the surface of the skin and reflect both of the UVA and UVB rays. 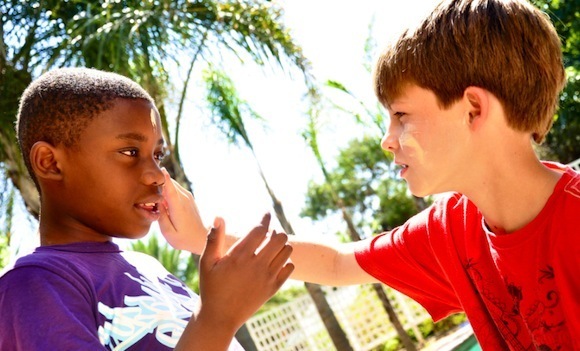 Apply the sunscreen generously before your child goes out in the sun - not after you notice their skin getting red! Don't forget the classic areas that are traditionally forgotten - nose, chin, ears, hands, feet and behind the neck. Make sure you reapply the sunscreen every 2 to 3 hours, or especially after sweating or swimming. Getting your child into the habit of wearing a hat from a young age is a real winner! This will develop into a life-long habit that will serve them really well in warding off UV damage. Besides hats, there are many great clothing ranges available that contain specific sun protective qualities and many are designed for practical outdoor activities. Protective clothing, hats with brims, and sunglasses are also available for babies. A large umbrella or shade of sorts at the beach or picnic or such, is hugely welcome where sun safety for kids is concerned. Some medications cause sun sensitivities. If your child is under any sort of prescription medicine, make sure to establish whether or not they may cause the skin to be extra sensitive to the sun. This can cause a sunburn if you are not made aware and are thus able to take extra precautions. Prescription antibiotics, malaria tablets and acne medications are the most common known to cause this condition. Make sure you are a great example to follow. If you don't care about your own sun safety, how can you possibly practice any legitimate sun safety for kids? So, make sure to set a good example for your kids. There's even a web site devoted solely to sun safety for kids. Started by a group of dermatologists from The Los Angeles Metropolitan Dermatological Society in 2001, they wanted to create a "Comprehensive Guide to Sun Safety for Schools" . There is also information and activity sheets for children for school or home use, a sample curriculum, as well as some other ideas. Sun Safety for Kids is currently participating in a five-year school policy development program funded by the National Cancer Institute at the National Institutes of Health. Additional participants include the University of Southern California, the University of Minnesota, and Klein-Buendel, Inc., a Colorado-based health communication firm. They have also created a sunwise program. And then there is this cute little video for kids on sun protection. Recommended for children ages 2 and up, it aims to help young children understand the importance of sun protection through this fun, four minute, sing-along video.